"Intellectual Property Cases and Materials" by Mary LaFrance, David L. Lange et al. This edition has been thoroughly updated to include all significant legislative and judicial developments through April 2007. In addition, existing materials have been streamlined and restructured, and new topics introduced. In this way, the authors have enhanced the depth and breadth of coverage and facilitated short forays into optional topics, while giving professors tremendous flexibility in choosing the areas they wish to emphasize. In addition, by selecting among the topics presented within each broad subject area, a professor may change the emphasis or scope of the survey course from one year to the next without ever having to change textbooks. 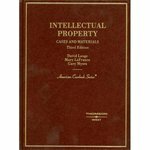 LaFrance, Mary; Lange, David L.; and Myers, Gary, "Intellectual Property Cases and Materials" (2007). Books. 40.